Pomfret is a delicacy which is the pride of Goan cuisine. Fresh whole pomfret stuffed with green chutney and rawa fried is divine. 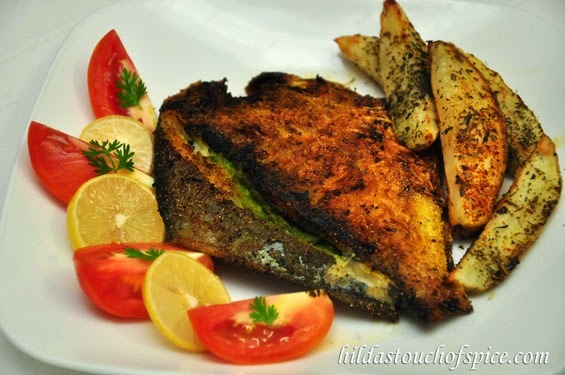 This pan fried Goan preparation is as good as the Rechado. The fish and the stuffing ingredients have to be very fresh to bring out the best flavors. Pomfret is a delicate textured fish and needs tender care while handling. The green chutney needs to have a perfect balance of spices and condiments to compliment the fish. Grind the ingredients mentioned below to a thick smooth paste with minimum amount of water and place in a bowl to be used for stuffing the pomfrets. Store the remaining green chutney stuffing; if any, in a glass jar or plastic container with a lid; in the fridge for a couple of days. In case you wish to store for a longer period then chill or freeze. Slit the mouth, discard the gills, trim the fins & tail. Make sure the mouth cavity is cleaned thoroughly. Wash & drain the fish thoroughly. Lay the fish flat on a cutting board and slide in a very sharp knife to make a slit about 2 cm away from and along the top edge towards the tail (on the thicker side (length-wise) of each pomfret; away from the stomach-mouth cavity) and run your knife in gently to form neat pockets on both the sides of the pomfret. Do not cut open all the way through. Repeat the procedure for each whole fish. Rub each pomfret from outside, mouth cavity and in the pockets with some salt, turmeric & lime juice. Marinate for about 15-20 mins. and then stuff the pockets and cavity with the prepared green chutney filling. Refrigerate for another 15 mins. When ready to fry, first gently roll each stuffed pomfret in rawa and then dust/sprinkle flour on both sides. Arrange all the pomfrets on a tray. Heat a pan/skillet with enough oil for pan frying till hot. Reduce heat to medium and gently slide the pomfret in the hot pan. Cover the pan with a lid to speed up cooking and to avoid spluttering. Fry for at least 5 minutes on each side. Use two spatulas to get a better grip and flip the fish with ease. Lift the lid and check in between to ensure even browning. Fry until both sides of the fish are cooked through and evenly brown. Serve on a platter garnished with fries or baked potato wedges, quartered lime/lemon and salad. A pinch or two of sugar helps to balance the flavors, cut the acidity & gives a sheen to the fried fish. Use oil sparingly to avoid the fish from turning soggy. Remember the fish will release its own moisture and so will the stuffing. Instead of tamarind you may use lime/lemon or vinegar. You may add more chillies if you like it spicy but it is better to have a perfect balance of flavors. You can make one or two pockets as per your preference. You may even de-bone completely and stuff but you need to tie it firmly to hold the fish together. Feel free to use any one – flour or rawa (semolina). You may pan fry, grill, bake or barbeque the stuffed fish. It all depends on personal choice. Make sure you do not over stuff or the chutney may spill out. Use two spatulas to lift and flip the fish in the pan and to transfer on to a serving plate. You can use a string to tie the fish to hold it together while frying.